Hope you all are having a great day. Mine was a bit boring to start with. Had an out of office meeting scheduled for the day but (sigh) it got cancelled due to some unavoidable circumstances. So, sat in office the whole day. Never mind, got some important stuff finished. 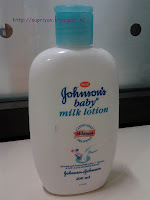 Coming back to the agenda, the product I am going to review today is a milk lotion from the Johnson's baby care range. 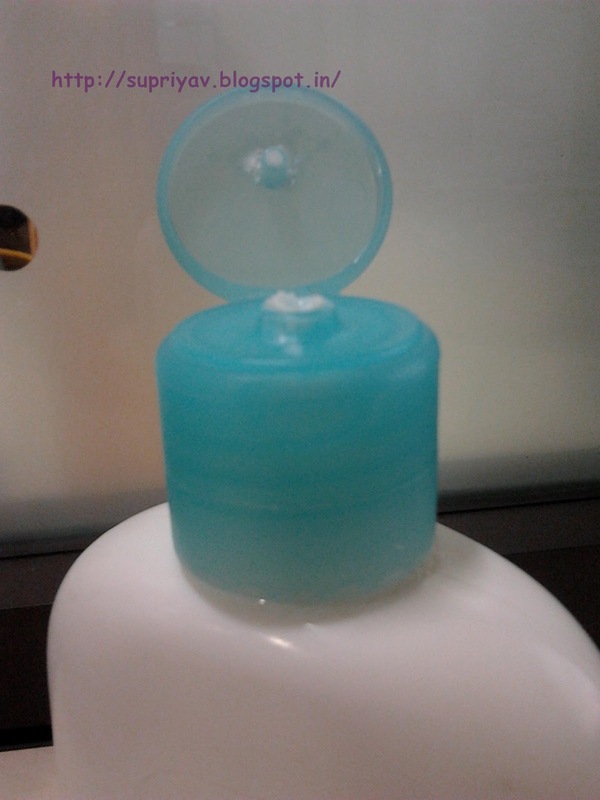 It comes in a white sturdy opaque white plastic bottle with a light blue color flip open cap and also a screw open mouth. The product is enriched with Natural milk extract, Vitamin A & E and it claims to leave skin feeling baby soft. I am sure all of us desire smooth satin body skin. 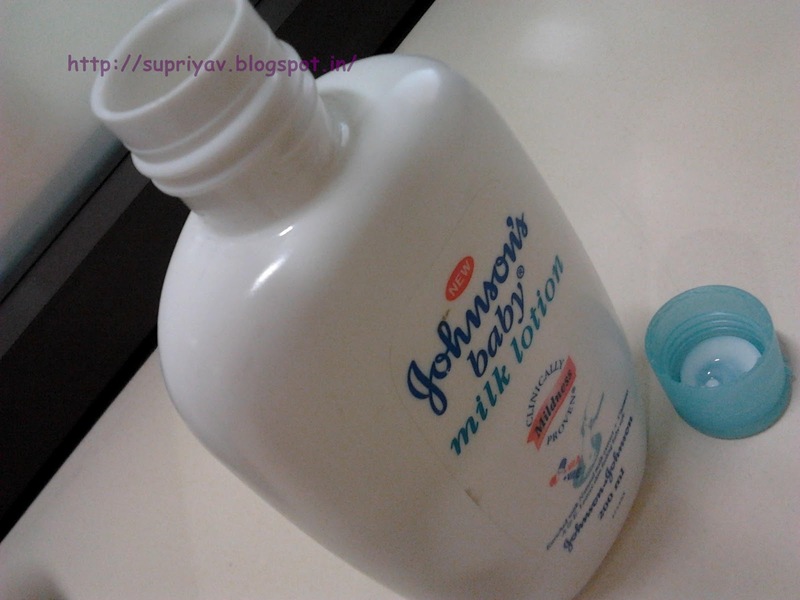 I have always wondered how to get skin as smooth as of babies. For quite some time I am experimenting using baby products, as they are mild on skin. 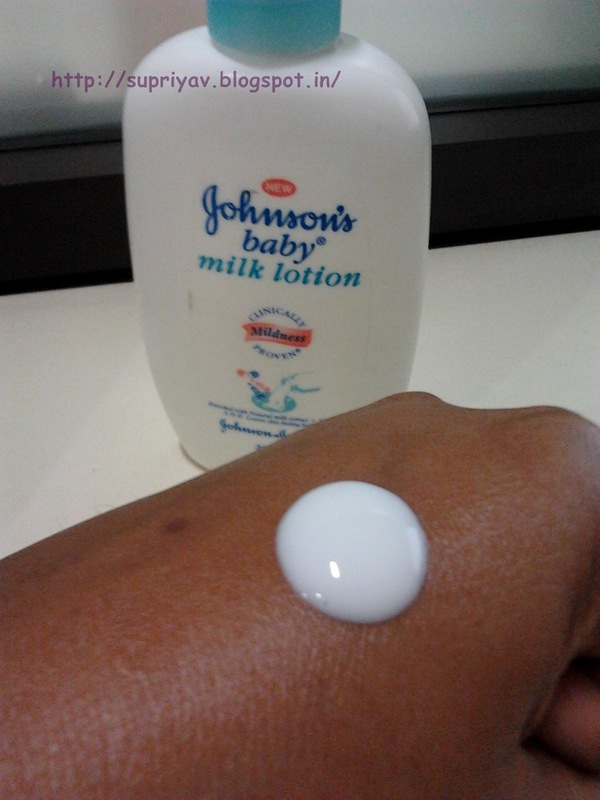 This milk lotion is white in color and smells heavenly. The texture is a bit runny and not sticky at all. It quickly absorbs into the skin and leaves a glow. The product is suggested for usage on face, hands and body, however, I use this only as a hand lotion and keep it at all times with me. My hands are very dry so after each hand wash, I make it a point to apply this.Once applied, it keeps my hands well hydrated for a couple of hours. The complex list of ingredients do worry me a bit especially with all sorts of parabens in it. I really am not sure how safe is this for baby skin or for our skin as such. This product is doing a good job on my super dry hands skin. I will be buying it again for sure as a quick moisturizer for my hands. The only con I feel is that it cannot keep my skin hydrated from long and I have to re-apply it regularly. But I do not mind doing so as I love the fragrance it leaves. yes shruti.. i am a fan:) how old is your son? 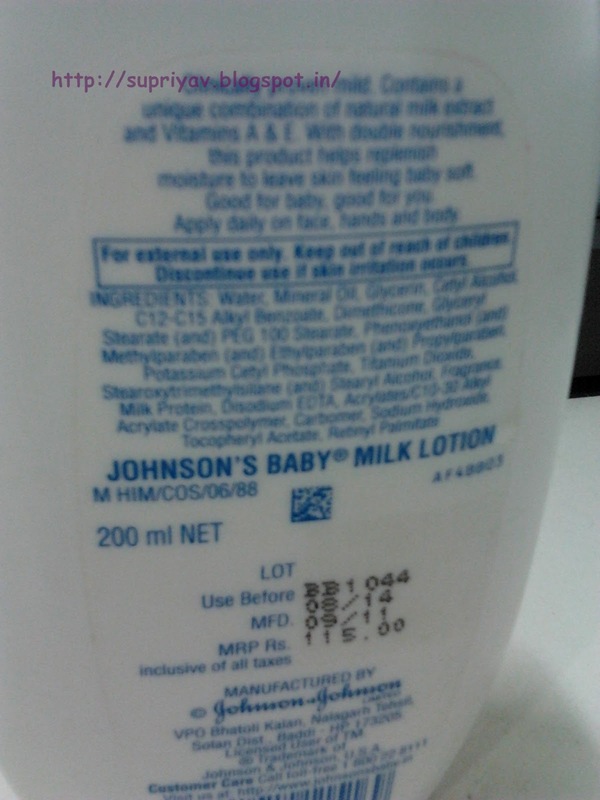 oh wow dear.. i have heard johnson baby creams are more hydrating than lotions... is it true? yeahh...dats right..much hydrating n moisturizing dn lotions..fr winters dey r just suprb..
don'gel with my skin in summrs..still i love them..
That's very nice post.Baby skin is very sensitive.Every parents should take care of their baby skin specially from Johnsons baby cream.Thanks for the great review. 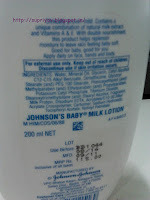 Johnson’s baby milk lotion is better than other brands. Its trusted brand and the products are thoroughly checked and tested by the concerned authority whether it's safe for the baby skin or not? Because the baby skin have more porous than the adults and that cause a lot of harms to their body if the chemicals involved in the manufacturing of this product are toxic in nature. Really, parenting is the toughest phase of anyone's life. You should always attentive to your children and care for with loads of love. I am the Girl with the Pretty Bow ~ Giveaway! How I Wonder What I Am?